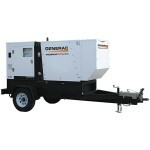 Home / Commercial / Mobile Generators / Magnum Mobile Generator Model# MMG 75 – IN STOCK!! The MMG 75 is built with the patented front flip-hood design for easy access to routine service and maintenance areas. Powered by a John Deere PowerTech engine the MMG 75 utilizes a catalyzed exhaust filter that contains a Diesel Oxidation Catalyst (DOC) and a Diesel Particulate Filter. (DPF) The DOC reacts with exhaust gases to reduce the carbon monoxide, hydrocarbons and some particulate matter(PM). The downstream DPF traps and holds the remaining PM, which are oxidized within. Revolutionalizing the generator industry, the MMG 75 is equipped with Magnum’s new Power Zone digital controller.